Most of us see the shopping mall as a culinary wasteland, but West Mall’s JARDIN offers a marvelous mall dining experience with its bright pink walls and sparkly chandeliers. The cafe (formerly called Jardin des Tuleries) is renown for its desserts and pastries collection of delightful macarons, crème brûlée, tiramisu, gelato and more. 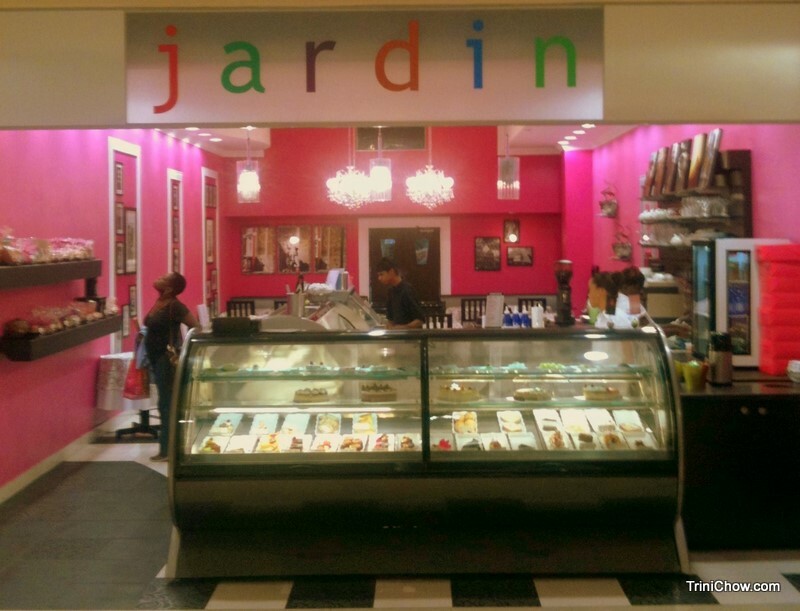 JARDIN also has a full menu of soups, salads, crepes, sandwiches and entrees. Our pick on a busy shopping day is the Salad Nicoise, which is pumped up with potatoes, fish, eggs and other goodies. Features – Full service; Gelato counter (gelato is made by Ciao Cafe); Extensive dessert collection; Offers catering services for their cakes, cupcakes and other desserts. Tags: Shopping Mall Trinidad, Trinidad Restaurant Guide, West Mall Restaurant Trinidad. Bookmark the permalink.